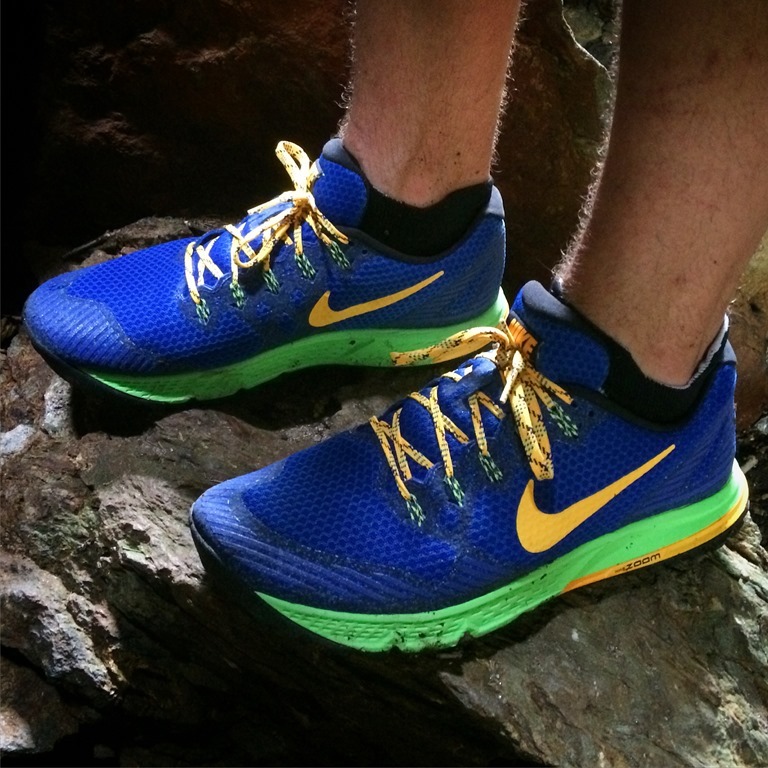 Back in March I wrote a very positive review of the Nike Wildhorse 2. 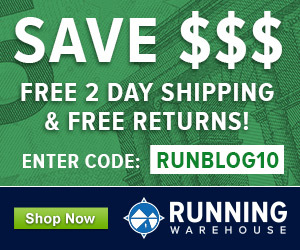 I’d put a bunch of miles on them over the winter, and was impressed by the combination of a lightweight, minimally structured upper and a well-cushioned, but reasonably thin sole. 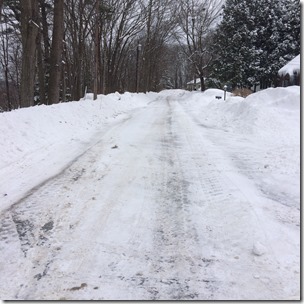 They also provided solid traction on the crusty ice and snow I deal with for 3-4 months per year up here in New Hampshire. 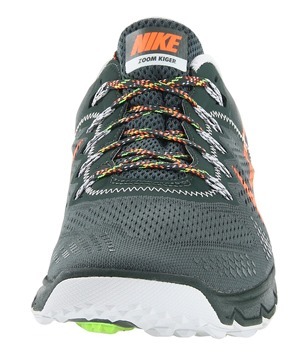 The only major problem I could see with the Wildhorse was that it was very similar to another shoe that has gotten rave reviews: the Nike Terra Kiger. I haven’t tried the Kiger myself, but the upper is supposedly softer and more comfortable, and the added zoom air unit in the forefoot should provide a softer ride up front. 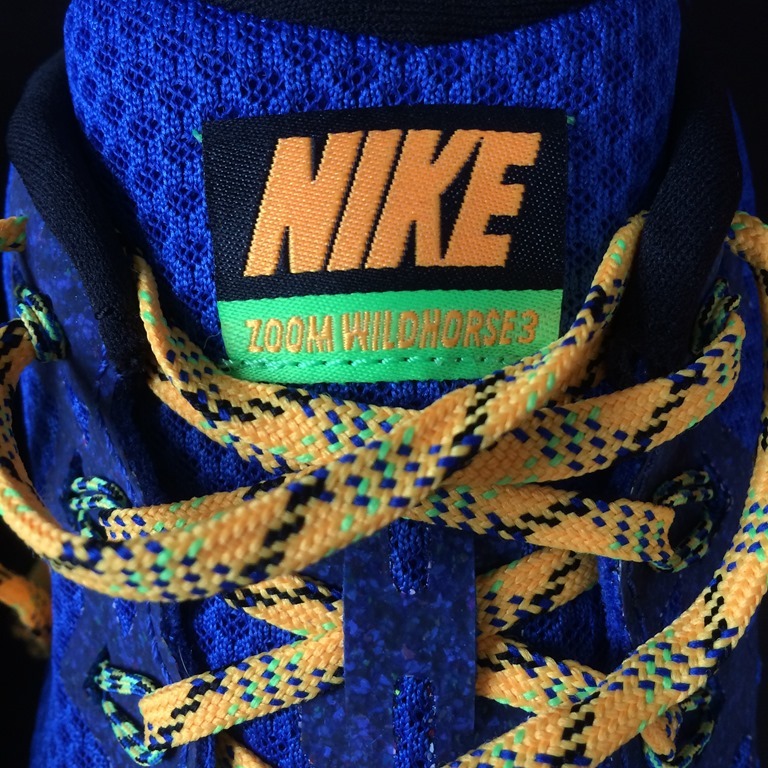 The extensive overlap between the two shoes was a bit puzzling, and apparently Nike agreed since version 3 of the Kiger and Wildhorse sees them start to diverge more significantly. Nike sent me a pair of the Wildhorse 3 a few months ago (Disclosure: these shoes were review samples provided free of charge by the manufacturer), and I’ve worn them extensively since. I’ve used them casually, for hikes in the Green Mountains of VT, Shenandoah National Park in VA, Mt. Major in NH, and a few others. I’ve also put in running miles on local trails – nothing too technical, but enough to get a sense of traction and comfort/protection. Per Running Warehouse, the Nike Wildhorse 3 weighs in at 10.3 oz in men’s size 9, and has a drop of 8mm (28mm heel, 20mm forefoot). That’s a gain of about an ounce in weight over v2, and an addition of 6mm of stack height to the heel and 2mm to the forefoot (the Wildhorse 2 was 4mm drop with stacks of 22mm heel, 18mm forefoot). The specs tell the tale with this update – the Wildhorse 3 is an all-around beefier shoe than v2. This might upset some fans of prior versions, but the reality is that Nike made this move to differentiate the Wildhorse and the Kiger, and the Kiger (now in v3 as well) still exists on a lighter-weight, 4mm drop platform for those who prefer less shoe. My take is that although I really liked v2 of the Wildhorse, v3 is a worthy successor and doesn’t destroy the essence of the shoe. One of my areas of concern with v2 of the Wildhorse was durability of the upper, particularly in the area of the forefoot. I didn’t experience any tearing in my pair, but the material appeared to be pilling/fraying a bit at the surface and I don’t think they could handle hundreds of miles on the trail. Wildhorse 3 remedies this with a more substantial, double-layered mesh upper and a welded rand that extends from the outer midfoot to the region behind the big toe on the inner side of the shoe. The inner layer of the upper is super-soft and feels great against a bare foot – I’ve worn them sockless several times with no issue short of the development of a terrible stink (I’ve since ceased sockless usage to spare my family…). In most other ways the Wildhorse 3 upper retains the minimally structured feel of v2, and overall I’m quite impressed with it. One issue I did have with the v2 was a bit of looseness in the heel, which caused a bit of rubbing and skin abrasion on the first few wears. WH 3 adds a slightly firmer, more substantial heel counter which helps to hold the foot in place for a better lockdown in the heel. I’ve had no issues with abrasion or blistering in v3. As with the upper, the sole of the Wildhorse 3 is beefed up via the addition of about 6mm of midsole cushion in the heel and 2mm in the forefoot. The shoe retains a zoom air unit in the heel, and there is a rock plate in the forefoot. Overall, the ride is cushier than that of v2, though I can’t sense the bouncy presence of the zoom air unit as much in the new version. The added midsole height seems to have muted the feel a bit. 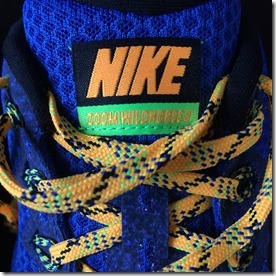 Whereas I felt like the earlier versions of the Wildhorse were something like a Nike Free Trail (minus the flex), the Wildhorse 3 is probably more comparable to something like a Zoom Elite Trail. The outsole of the Wildhorse 3 also gets a makeover. The lugs are a bit larger/longer in the central region, and those surrounding the margin of the sole are much more prominent. Traction has been decent overall, but I’ve experienced some splippage on wet rocks. Protection is also very good, better than v2 (not a surprise given the more substantial construction of the update). 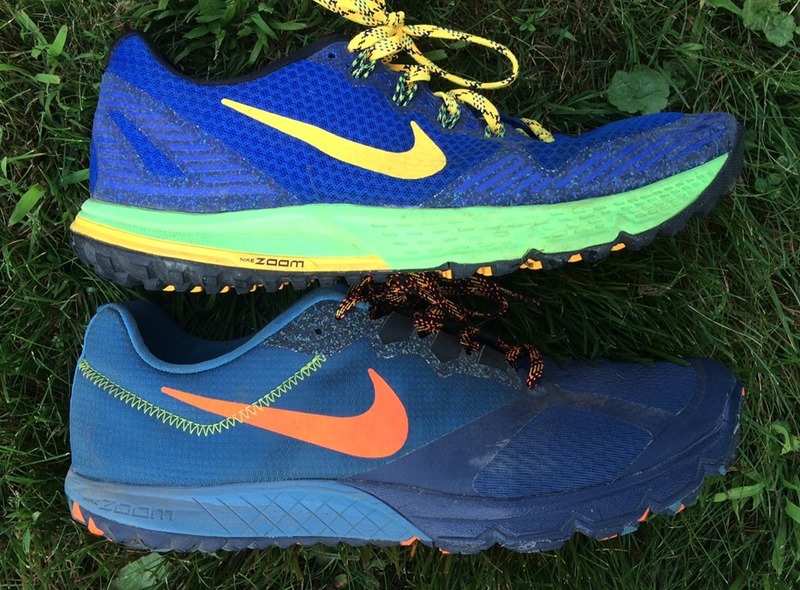 The ride of the Wildhorse 3 is comfortable, but the shoe isn’t quite as nimble as v2. I can feel the added weight and structure, but that combo also makes me feel a bit more protected on the trail. It’s a typical tradeoff that you deal with in trail shoes – lighter and nimbler vs. sturdier and more protective. As with the previous version, the Wildhorse 3 is capable of handling roads as well, though with a full coverage, lugged outsole it’s definitely more at home on softer ground. I’ll finish with my favorite aspect of the Wildhorse 3. The shoe fits me incredibly well, and fit is much improved over v2. I found the forefoot of the v2 to be a bit shallow, and v3 adds a bit of volume up front. It’s hard to say, but it also feels like the forefoot might be a tad wider, and viewing them side-by-side from the top it appears that v3 is a tad longer and slightly more tapered at the toe, but his doesn’t make it constrictive up front. The great fit has made me choose the Wildhorse 3 for several long hikes (I prefer to hike in trail running shoes – haven’t worn a hiking boot in years) and they provide great all-day comfort. If you are a fan of the fit and feel of earlier versions of the Wildhorse or Terra Kiger but feel the need for a bit more protection, the Wildhorse 3 is a great choice. 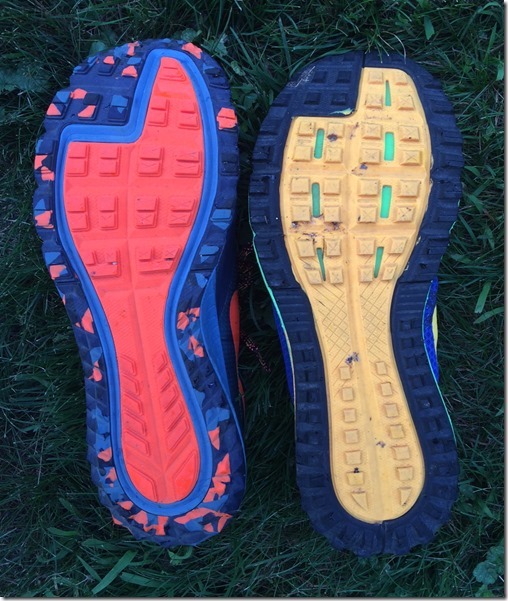 If you want to stick with less shoe, the Terra Kiger 3 stays at 4mm drop and has less midsole stack. I think the move to differentiate the two shoes was a wise one, and allows for more customization of shoe to specific trail needs. I’ll hopefully have a review of the Terra Kiger 3 up sometime this summer, stay tuned! The Nike Wildhorse 3 is currently available on-line at Nike.com and Road Runner Sports. 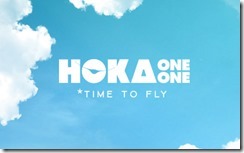 Purchases made via these links help to support this site – thanks! It’s a beast, and not in a good way IMO! 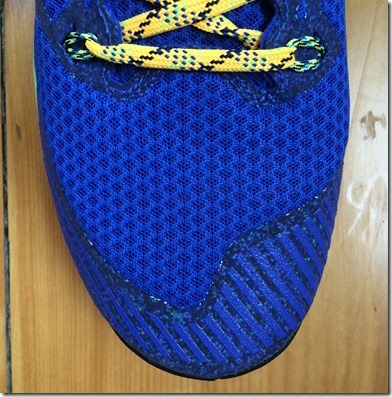 As you can see by the post about road shoes for trails, I would say most trail runners only want a slightly beef up road shoe for their favorite trail shoe. Like the Lunar Tempo: 6.8 oz. Just a little more rubber on the bottom, maybe a toe bumper and you got a great sub 8 oz. trail shoe. I wish the shoe makers would wise up. 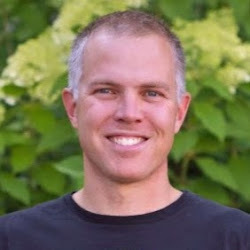 You need to lift your feet more on trails to keep from tripping, and light shoes help this. 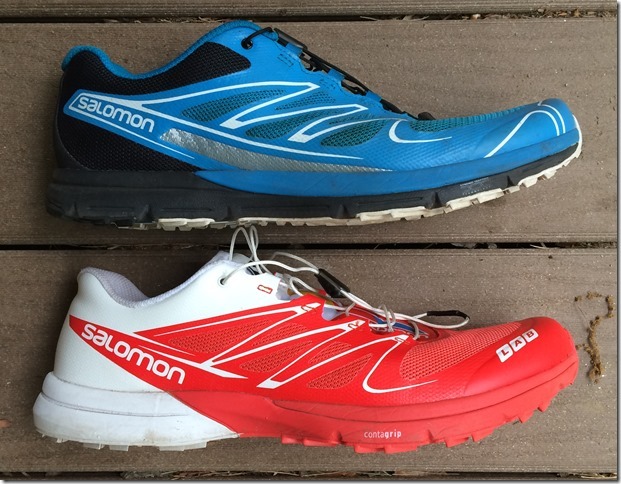 Even ultra runners want light weight shoes. Wise up Nike! It all depends on the person and the trails. 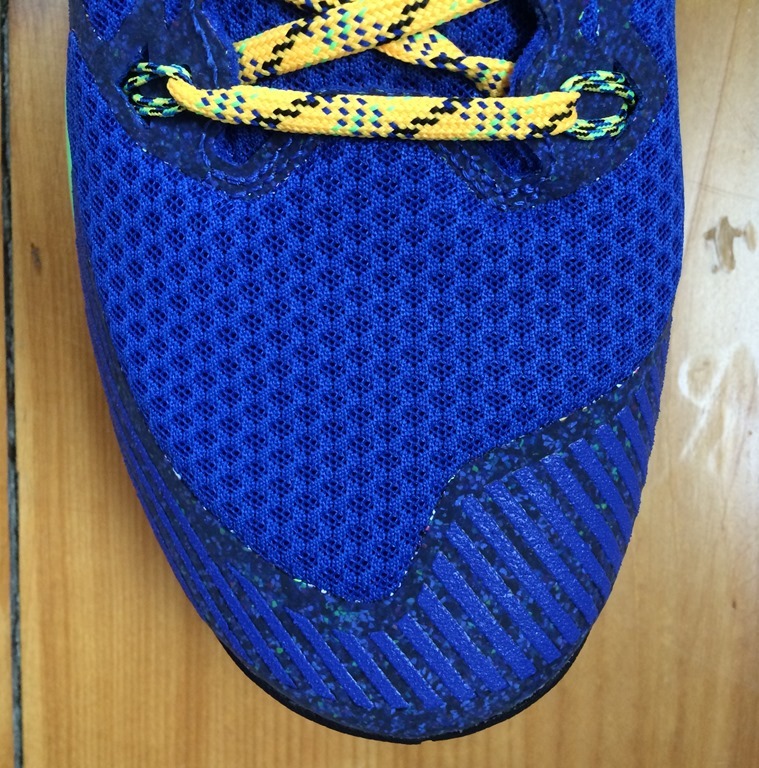 In rocky, technical, or canted trail conditions, a more beefed up shoe serves a purpose. Frankly, while I actually liked the Wildhorse V2, even up to 13 hour ultras, after using them for 6 months, I developed lower leg issues probably due to their narrow racing flat style heal and minimal drop. I am sure lapsing back to a rear to mid foot strike and years of using the Cascadia contributed to the issues, but I am looking forward to trying these out. 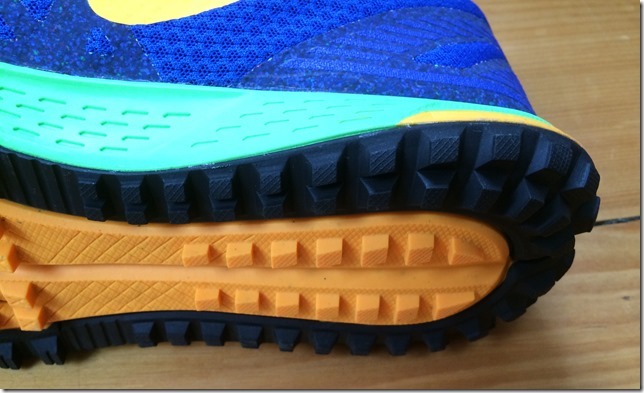 Nice review Pete, I did not realize that Nike had made these design change decisions for the Wildhorse 3. 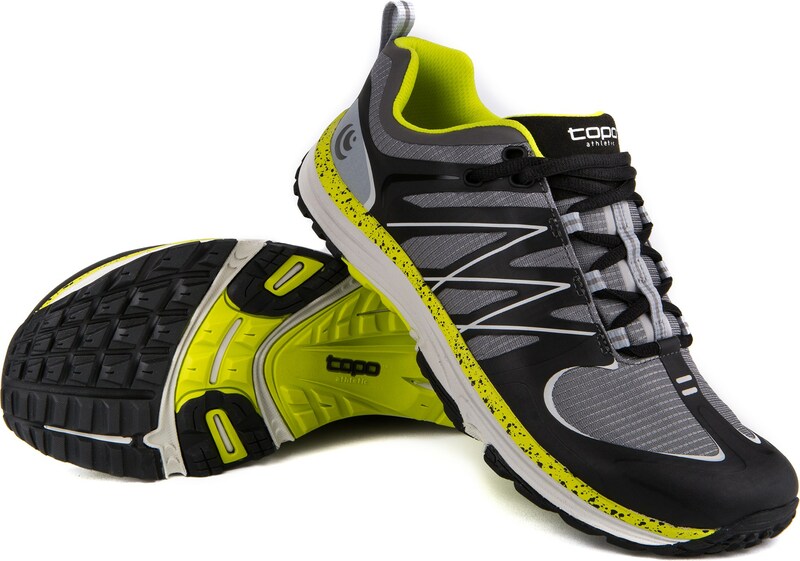 It actually sounds like a trail shoe that I might like for ultras. Keep up the great work! Nike’s trail shoes have won me over, mostly because they work for my foot shape and fit like a glove. Before that I was in Brooks. Thanks for the info on the V3 update! I have run I wild horse 2 and it was a good fit, have found the kiger 3 to be a much better shoe. I feel that the 4mm of the kiger is not enough for long runs. I will hook up some wild horse 3 in the coming weeks and see how they go. Nike has done a great job with the fit and feel of the shoes, but the tread on the kiger pulls away to early in the life of the shoe. Thanks for the review Pete! I picked up a pair and just tested them out for 15 on the trails. They definitely do not run like an 8 drop, which is fine by me. Felt more like a 4-5mm range. With the wider forefoot, these won me over. Coming in late, but how is the sizing on this shoe? A lot of people are saying to buy a half size larger. Anyone find this to be the case? True to size for me Matt. Size 10 in both Kiger 3 and Wildhorse 3.
i’ve worn size 10 nike pegasus for years and these are a bit short. i’m going to see if going up “another” 1/2 size to 10 1/2 makes a difference. Pretty sure I wear a half size bigger in the Wildhorse compared to the Pegs. I am on my second pair of WH3. The upper is not particularly water resistant. I live in rainy Oregon and use them on wet trails daily. Your feet will get wet if it is raining hard or the trail is flowing like a river. I use wool sock and don’t worry about my feet getting wet.